You child has been falling behind for a while? We can help them fill the gaps. Our experienced advisors take the time to match a tutor to your child's personality and to the subject matter they need to review. The purpose of remedial help is to ensure that the student is up to date on one or more subjects for which they may have fallen behind. The tutor and the student work together to define concrete and achievable objectives in the short and long term. As such, the student, parents, and tutors can follow the progress over time. Through personalized support, the tutor ensures that they are taking a unique approach tailored to your child in order to address concepts seen in class, consolidate what they've learned, prevent them from falling behind or help them catch up, suggest efficient work methods and learning strategies and, if needed, provide further advancement. 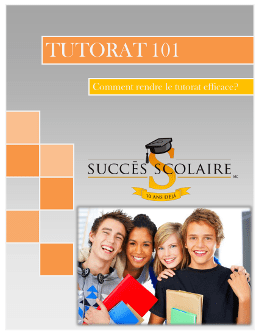 Having help from a tutor offers many advantages. Students are often more concentrated and are more comfortable about asking questions. The tutor can take the time to explain, step-by-step, the concepts that are causing problems, in a personalized way. Through the relationship of trust established between a tutor and their student, a favourable learning environment is created. The tutor, who also acts as a motivator, is often the source of inspiration for students. Many regain confidence in themselves as they see their grades increase. As a result, they participate more in class and become more interested in school.